o The tapestry brick and stone Gannett Building, located in Portland’s historic Old Port District, was constructed in1923 and followed in 1947 by an adjoining structure. 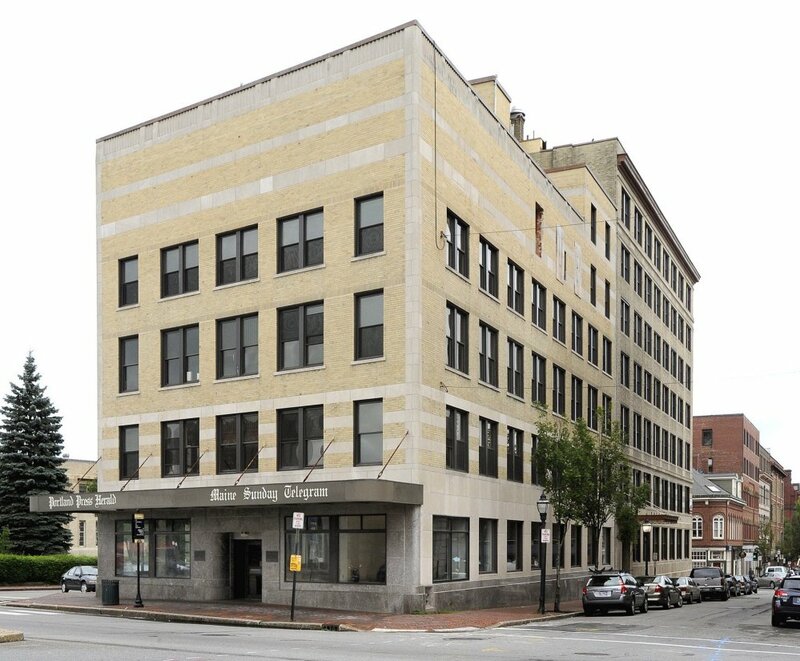 The building was designed to house the offices and printing plant of the Portland Press Herald, Maine’s largest newspaper. Maddy Corson, granddaughter of the former owner of the Portland Press Herald and the Maine Sunday Telegram, recalled, how, in 1945, the building was ‘an energetic powerhouse at the heart of the city.’ Housing the Portland Press Herald, the Evening Express and the Sunday Telegram, as well as a pair of TV stations, the building dominated the newspaper landscape until the Press Herald moved to another location in 2010. In 2012, Portland real estate developer Jim Brady put the building under contract and announced plans to open Portland’s first independent boutique hotel. Aptly named The Press Hotel, it retains virtually all of the building’s architectural details, including its vintage exterior lettering and the newspaper’s ‘City Room’ repurposed as the Inkwell Bar. Among other unique features, guestroom hallways are lined with custom-printed wall coverings that feature actual newspaper headlines from the Press Herald’s archives. Many of its artifacts have also been salvaged, including a scale used for weighing the huge rolls of newsprint right down to the ounce. The hotel has its own art gallery, open to guests and the greater public, where collaborations with area museums will be planned and commissioned paintings, sculptures, and textiles from locals will be displayed. The extensive rehabilitation and adaptive reuse to a boutique hotel was completed and opened to the public in May 2015. With the help of state and federal tax credits, this LEED certified building, rehabilitated a landmark building in Portland, allowing the building to be repurposed while still paying tribute to the property’s publishing legacy.